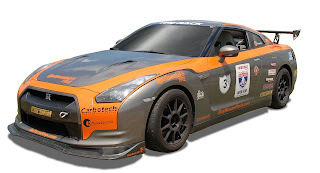 Fort Mill, SC – (May 13, 2009) – A 2009 Nissan GT-R equipped with Continental Tire ContiSportContact 3 ultra-high performance tires won top overall honors at the 2009 Tire Rack One Lap of America presented by Motor Trend competition. Driven by Steven Rankins and Will Taylor, the GT-R racked up 5215 overall points to take the win. When the smoke had cleared, Rankins and Taylor had won seven out of 17 timed events; they also had seven second-place finishes as well as one third. Tire Rack One Lap of America is eight days of competition featuring some of the fastest street-legal cars, on a number of America's most challenging racetracks. This year's event tested the endurance of a field of 63 vehicles and their drivers who travelled nearly 3,400 miles from venue to venue at legal speeds, while measuring their performance during skidpad and autocross competition, as well as drag, oval and open track road racing. In the first event of the week-long competition, the Nissan grabbed first place while setting an event record in a Wet Skid Pad Shootout, and held on to take the overall and class championship crowns following the final Dry Skid Pad Shootout at Tire Rack’s South Bend, Indiana headquarters on Saturday, May 9th. The team took best in the SSGT-1Big Bore Class, with a two-way wet cornering average of 0.953 g’s. The Nissan’s cornering capability broke the previous One Lap of America and Tire Rack wet track record of 0.930 g’s set by Glen Clark in 2004 driving a 1979 Porsche 911. Developed for performance vehicles, the ContiSportContact 3 is geared to provide shorter braking distances, enhanced handling characteristics and improved grip, especially on wet roads. It is available in a wide range of 17” – 21” wheel diameters with aspect ratios from 25 to 55, and carries a UTQG rating of 280 AA A.